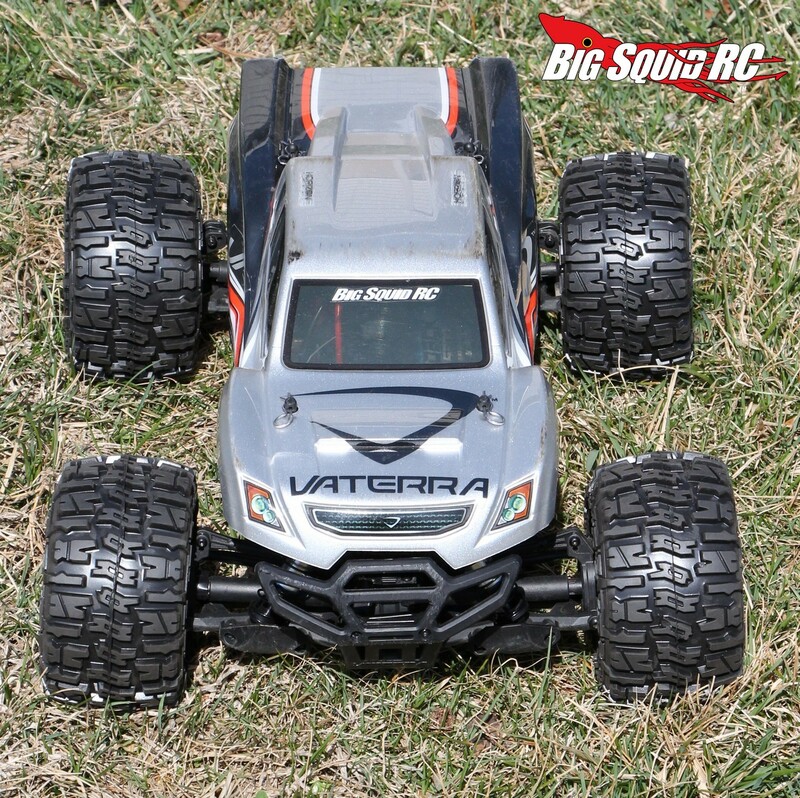 Vaterra Halix Hop-Up Series Part #2 – New Wheels & Tires « Big Squid RC – RC Car and Truck News, Reviews, Videos, and More! Changing to better tires is commonly known as the best “Bang for the Buck” upgrade that you can do to any rc car. While the Vaterra Halix comes with decent tires, we are shooting for top-of-the-line with our project truck so better units were a must. 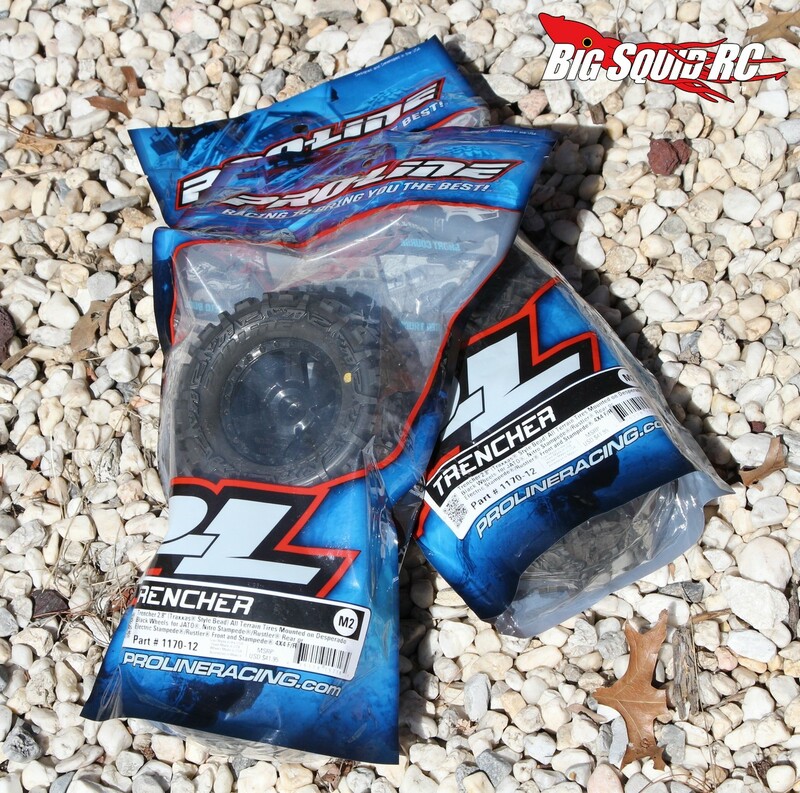 We consider Pro-Line Trenchers the best all around bashing tires that money can buy, so that’s exactly what we installed on our project truck. 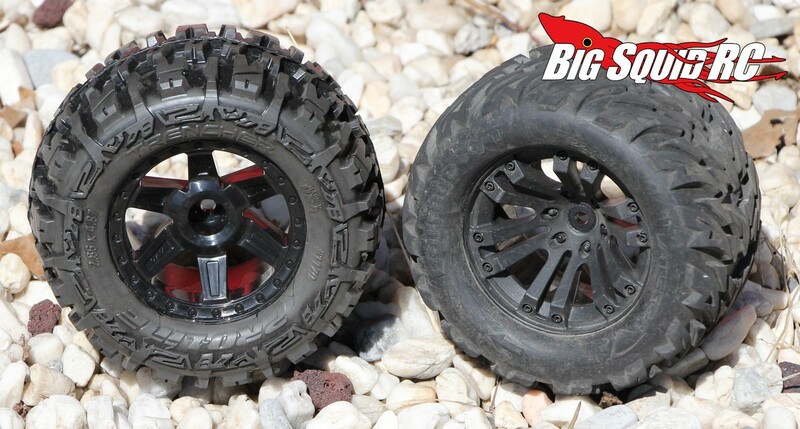 To be specific we went with part number #1170-12, Trenchers that came pre-mounted on Desperado 2.8″ wheels. Those particular units are the perfect size for the Halix, come in a long wearing M2 compound, have the proper size hex, and are only .1 oz heavier (6.1 oz stock, 6.2 oz for each Trencher/Desperado) than the stock units. 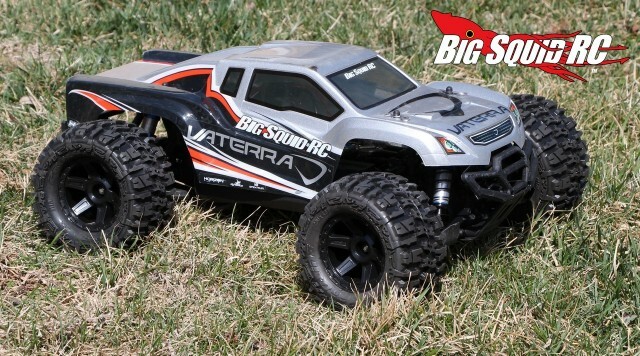 If you are noob to the hobby, changing out wheels & tires is the easiest mod you can perform. On the Halix all it takes is removing the four wheels nuts with the 4 way wrench that was included with the truck, mounting up the new kicks, and putting the four nuts back on, a process that takes under 5 minutes. 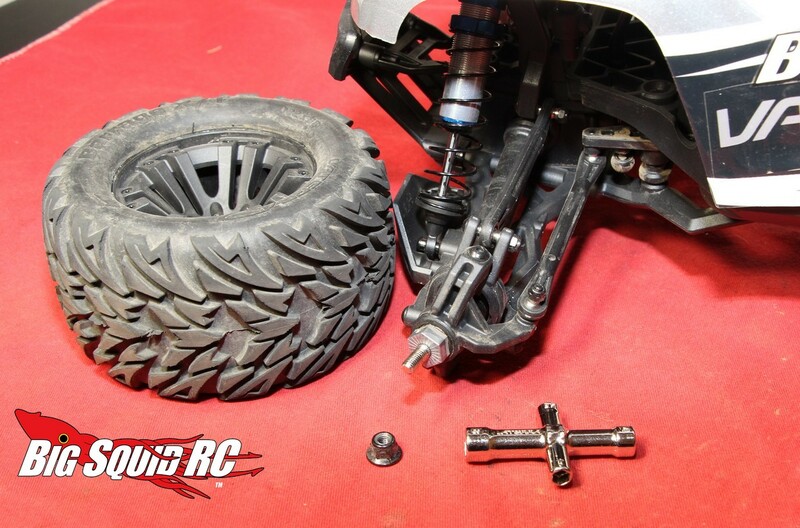 A couple of tips for the noobs – make sure the hex on the axle is properly inserted into the wheel, and make sure the wheels nuts are re-installed very tightly to prevent them from working loose. After installing the Trenchers our Halix had much more traction on dirt and grass surfaces. The big lugs on the Trenchers just love to chew up and spit out loamy dirt, and the Trenchers are equally good at finding traction on grass. The difference was night and day, and we highly recommend this upgrade for your Halix. 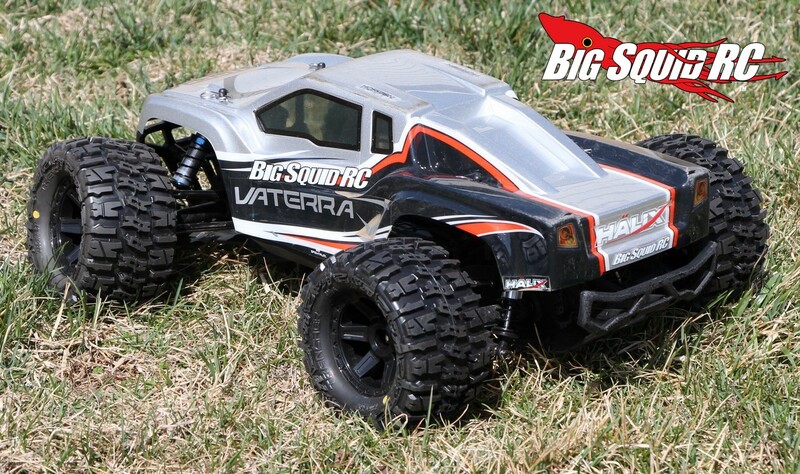 Our next hop-up article will show you what it takes to install a new body on your Halix, until then check out This Link to read more how-to articles on BigSquidRC.